Care2 Causes | Will Michigan's Governor Follow Through on Abortion Rights? Will Michigan’s Governor Follow Through on Abortion Rights? One of the greatest victories for abortion rights from the 2018 midterms was the number of progressive candidates who managed to nab wins in governor’s races, often in states that had been under GOP control for years. The victories in New Mexico, Wisconsin, Kansas and Michigan turned around states that have been undermining abortion access for most of the last decade, if not longer — and they put the left in a position to, at the very least, stop more bans from coming down the pipeline. But in Michigan, Democratic gubernatorial candidate Gretchen Whitmer promised more than just maintaining status quo. When she ran for the party nomination, Whitmer promised a complete repeal of all abortion restrictions currently on the books and a plan to keep Roe v. Wade intact, regardless of what might happen at a federal level. She won the nomination, as well as the election in November — yet now we are more than two months into her administration, and she hasn’t mentioned abortion at all. Of these, the pre-Roe abortion law is the most ominous, and the easiest to address. There’s every indication that as soon as 2021, the Supreme Court will take up a case that would allow them to overturn Roe v. Wade and let abortion laws be set by each state — and in Michigan, a more than 100-year-old law has never been repealed. In the summer of 2018, Whitmer promised to resolve this issue if she were elected. 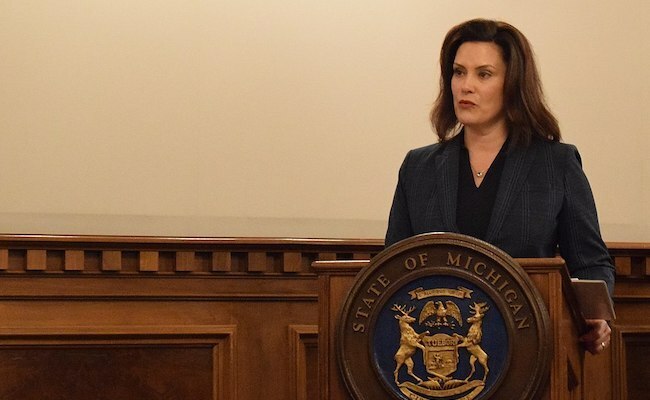 I am going to fight like hell to pass state laws that will protect women’s legal right to control their bodies and make their own decisions about whether and when to become a parent,’ Democratic candidate Gretchen Whitmer said in a July statement. So, where is that fight? The bill is written: On January 23, over a dozen state senators introduced Senate Bill 53, which would repeal abortion from the criminal code in preparation for the end of Roe. It went into the Committee on Judiciary and Public Safety, but never came out. And Whitmer, so far, hasn’t even mentioned it. There’s an obvious role for a Democratic governor right now when it comes to protecting abortion rights — and yes, being there to veto new bans is definitely necessary, too. The GOP is already introducing new bills meant to restrict abortion even further, with a 20 week pre-viability abortion ban and a D&E ban that would make abortion almost impossible to obtain as early as the beginning of the second trimester. Having a governor acting as a fail-safe to ensure that neither of these bills become law is a gift, and one that shouldn’t be ignored or minimized. But Whitmer promised to be more than just a veto on new restrictions; she vowed to be an active and vocal advocate for undoing the regressive abortion tactics of the right — and so far she has failed to follow through. Whitmer has the ability to champion SB 53 and demand action on it, even if it becomes clear that the proposed legislation will go no where in a GOP-dominated state house like Michigan’s. It’s an act she needs to undertake because there’s no political downside to stating that no one should be thrown in jail for terminating a pregnancy when Roe is returned to the states. Whitmer should champion the push to rescind the state’s antiquated and misogynistic criminal abortion code. Taking a stand opens a door for Democratic gains in 2020 — after all, a majority of voters support Roe v. Wade. And, like any politician, Whitmer needs to keep her campaign promises. It really is as simple as that. My guess is that Republican gerrymandering has given Whitmer a Republican legislature. The 2010 and 2014 elections took Congress away from the Democrats and stopped President Obama's from doing many good things.